So from time to time, one of us will approach a railroad with the rather outrageous suggestion that we repaint one of their steam locomotives, put together a freight train, and spend the day executing “photo runbys.” The target railroads are usually very accommodating. The 30 or 40 of us that can make it to any particular event have fun, take photos, swap lies, enjoy a good meal afterwards, then go our separate ways to do it again a few months later, somewhere else. 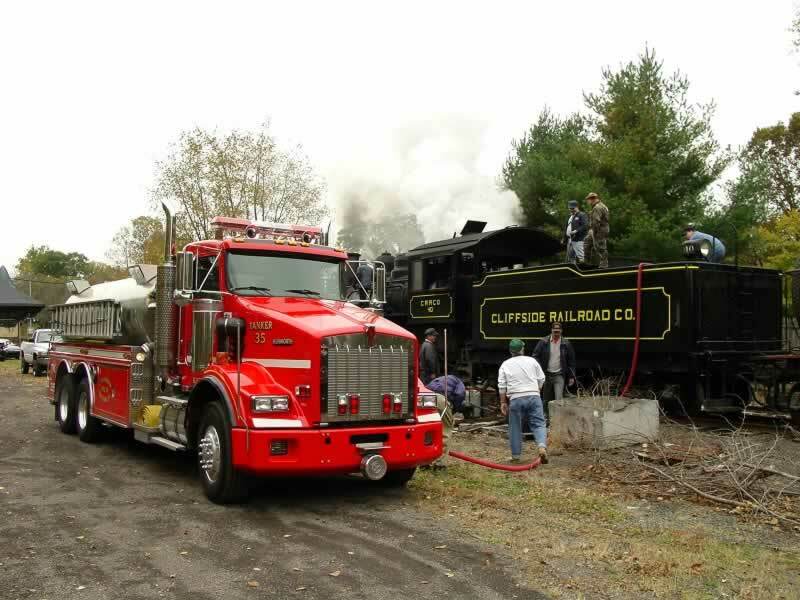 This year I put together two back-to-back events, a day on the Strasburg Rail Road in Strasburg, PA, preceded by a day on the New Hope & Ivyland in New Hope, PA.
At the Strasburg we did a pretty thorough makeover of the locomotive. Prep work included a trip to Abingdon, VA, to measure the bracket that holds up the headlight so that we could replicate it, and creating the correct lettering from photos in books. For no. 40, I relied almost completely on the photos in the Remember Cliffside photo galleries. (Here’s an email [below] to a friend that summarizes just how much detail you can pull out of those photos.) Other than paint, nothing needed to be changed – no. 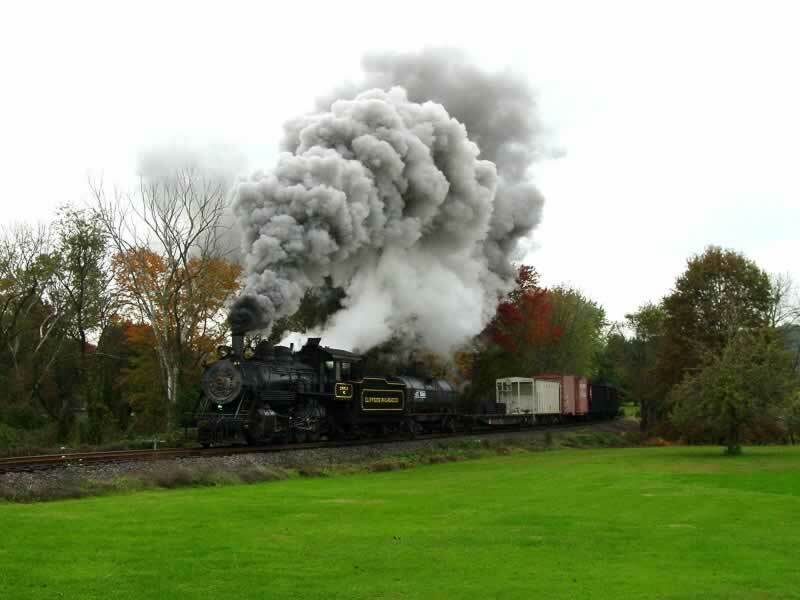 40 looks almost exactly as it did when it was built in 1926, which is extremely unusual for a steam locomotive. I measured the tender in July, and created the lettering to be cut from vinyl by a local sign company. The repaint instructions are attached ( PDF). Paul Harland, General Manager of the New Hope & Ivyland, prepared no. 40 and painted the tender and cab black, then applied the vinyl lettering. “Cliffside 40” reappeared for the first time on October 1. The project got off the ground in the spring, when I had a couple of telephone conversations with Paul Harland about the possibility. We agreed a price, and I sent out the attached flyer (PDF) to about 100 or so people. In July my co-sponsor, Jim Gunning, met me in Pennsylvania – we spent a day choosing photo locations and talking with Paul. The remaining time before the event was spent putting together a detailed schedule, getting the lettering made and shipped, etc. Which brings us to October, 2004. Two local photographers volunteered to cut weeds along the 12 miles or so of the line we planned to photograph, and also to remove about 30 saplings and trees on railroad property so that we could get photos on a stone bridge. I arrived in New Hope a couple of days in advance, did some final weeding and cosmetic work on no. 40, and we put a train together. After no. 40 finished her day’s run on the 20th, we sprayed the locomotive with water and threw a mixture of sand and crushed charcoal at the locomotive to make it look a little dirtier, then adjourned to dinner. At 7:30am on Thursday, no. 40 departed the station with approximately 30 photographers. The weather wasn’t particularly cooperative, but the fall colors were at peak, and we had a great time. The local volunteer fire department helped us out by bringing water when we needed it. 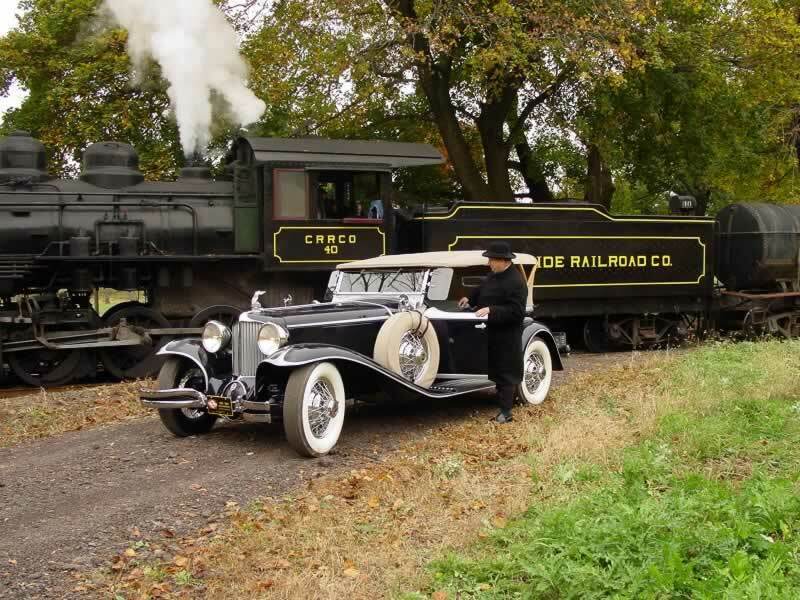 Paul Harland had arranged for a local car enthusiast to bring his award-winning 1930 Cord restoration to the railroad for some of the photos. Those photos were the highlight of the day. I guess the only thing missing was the chickens nesting in the tender. Why choose no. 40? 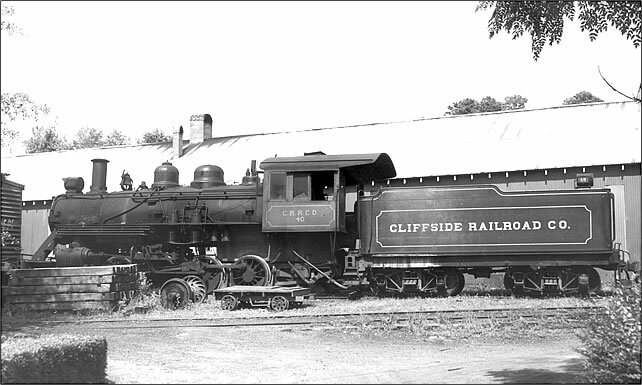 I never saw the Cliffside Railroad operating, and the only time I’ve ever been in Cliffside was on New Year’s Day, 1983, when a friend detoured us through there on a whim to see the railroad. (One of the October participants was a teenager in New Jersey when no. 40 was on the Cliffside, and actually started on a trip to Cliffside, but in the end went somewhere else.) 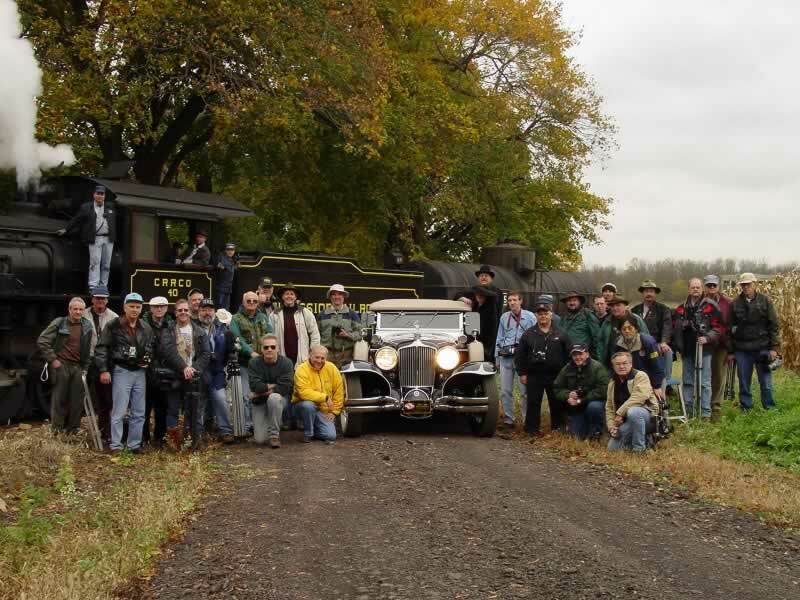 We choose our targets where the scenery, the cars available for the train, the locomotive, and the management can all combine to make for a memorable day. I had seen no. 40 operating in 1994, and always thought it would be a good candidate. No. 40 is now lettered for her owners again, and our little group has moved on. There was an event in Wisconsin a couple of weeks ago, and we will gather in northern California in January, and in Nevada in February. Spring will probably find us in Ohio. Maybe one day Paul will let us return to New Hope and re-create “Lancaster & Chester no. 40” for a day. Thanks again for remembercliffside.com, and I hope your readers enjoy looking at the photos half as much as we enjoyed taking them. —John A. Craft, Atlanta, Ga.
Actually, I have studied every photo I could find when making the lettering. 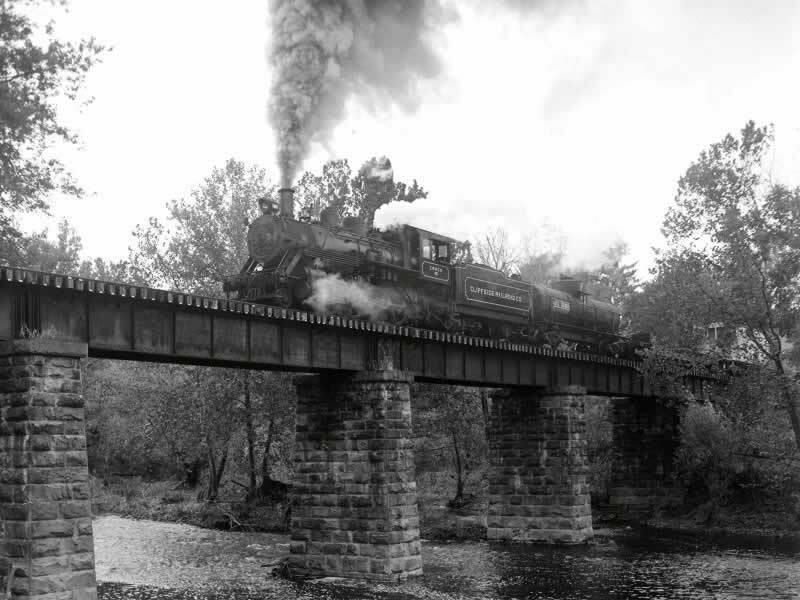 While you can’t tell a particular color in a b&w photo, you can tell that the cab was black in many of the pictures. The tone difference is pretty obvious for that green. If you can trust the dates on the photos at the “Remember Cliffside” web site, then 110 got a green cab in 1955. There are shots that pretty clearly show both the same tones, and different ones, dated for that year. Again, if you can trust the dates – and I see no reason not to. It would appear that 40 was still all-black as late as July 1958. Oddly, though, the photo that’s captioned “shortly after arrival from the L&C in 1947” seems to show a green cab. I have trouble believing the caption, because the locomotive is filthy, especially on the tender, and there are other “tells.” Tom Lawson’s 1960 photo shows a very clean no. 40, so it was probably painted that year. Scroll through the photos of 40 and you see two distinctly different paint jobs. The 1947 repaint (which I chose) is crude compared to the later efforts on the three engines. The lettering is a different “font” (stroke width, serif characteristics, etc. ), the “S” in the early scheme is very different, and the lettering is off-center in the striping box. On the fireman’s side the lettering starts 15″ behind the front vertical stripe, and ends 29″ from the rear stripe. The upper stripe is also a giveaway—in the later scheme the upper stripe is actually ON a rivet line, but before it was slightly above the rivets. And in the early scheme the stripe doesn’t follow the tender lip perfectly in one place—a screw-up that we replicated, by the way. Some time after that, I’m guessing someone came up with a new stencil, and as locos got shopped and repainted, they got the green cab and the new lettering. This time they managed to center the lettering in the striping box, too. Given what was going on in Durango in the 50s, I guess we can consider ourselves lucky that they didn’t put fake stacks on the engines. Click white circles to start. 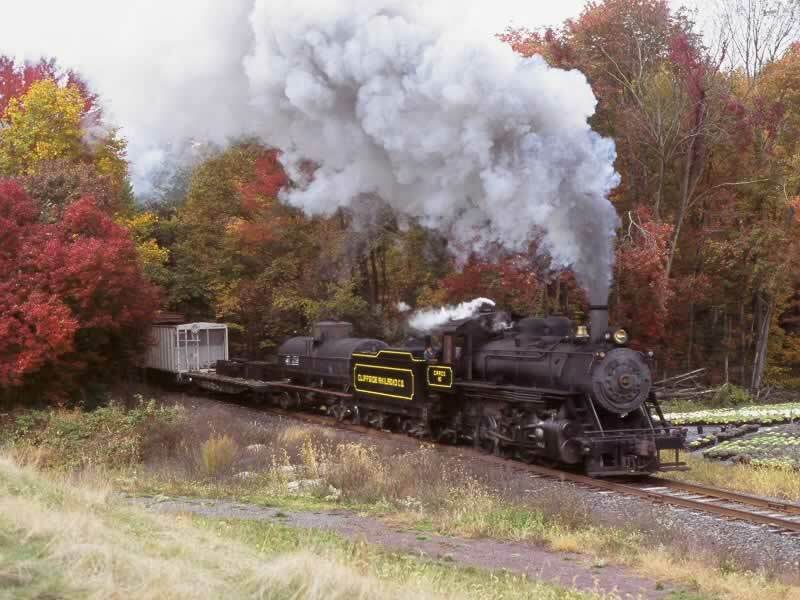 Old 40 chuffing through the woods of eastern Pennsylvania. At one of several "runby" positions. The Rushland Trestle over Little Neshominy Creek. No. 40's whistle warns big iron is coming through. Craig Reading with his award-winning 1930 Cord. Taking on water the modern way. The Train Shooters made a 27-second cell phone video of the train passing by. The sound was awesome but the picture was only 1-inch by 1-inch. So we made our own movie applying the still photos to the original sound. We’ve learned the old engine sat idle for almost a decade since 2004. And in the last couple of years the crew at Ivyland has been restoring old 40, aiming for completion in the Fall of 2017. Here’s a very nice video produced about that restoration. 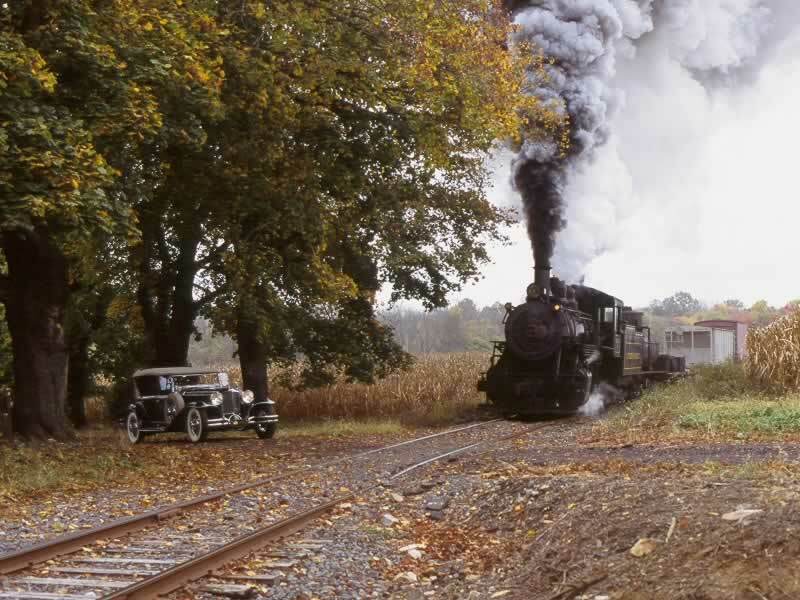 The Restoration of Number 40 from Bob Krist on Vimeo. Here’s a photo of old 40 likely taken in its last days in Cliffside. It’s parked by the engine shed where it spent much of the time, letting the more reliable engine 110 do most of the work. Engine 40, purchased by the CRR in 1947.